I was searching for an easy way to identify the hexadecimal number of a colour on a web site: they had black as the text colour and the link colour so no one could identify a link. 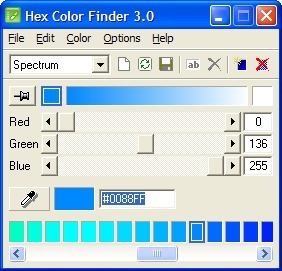 An internet search led me to Hex Color Finder, a nice free utility. It’s very simple: click and hold the eye dropper and place it on the colour you want to identify. Once identified the sliding scale at the bottom shows variances of that colour in case you’d like something darker or lighter. If you want it to stay as the top window while you’re finding the colour click the push-pin button. Simple to use and effective. Unfortunately this program dates from 2002 and was produced by NZWorks whose website is for sale by their ISP: don’t expect any updates.